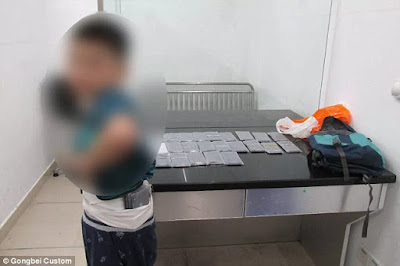 The terrified child admitted that his mother had demanded him to carry the iPhones and meet her at the other side of the border in Zhuhai, Guangdong Province. 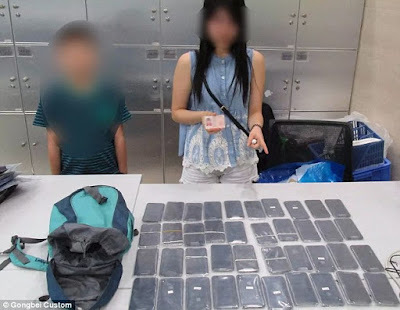 Officers were shocked to find that Li was carrying 40 iPhone Xs - on his body as well as in his bag. The latest iPhone X model sells 9,605 yuan (£1087) each at the Apple stores in China. Customs officers later managed to get in contact with the boy's mother, Ms Li, after calming and comforting the child. The incident has been passed onto Zhuhai's anti-smuggling bureau for further investigation.